Indeed, in most regions of the West, collaborative efforts between local communities and public land managers have borne rich fruit and demonstrated the capacity to move beyond what, at one time, seemed to be especially thorny and intractable challenges. Place-based collaborative initatives are described by Barb Cestero of Headwaters Economics as initiatives that “focus on a specific geographic locale with which residents identify, including public land and encompassing nearby human communities.” These efforts can be initiated and facilitated by the federal land managers within those geographies but may also be led by local volunteers and community leaders. These collaborative initiatives can range in structure and format from ad hoc working groups, which may organize around short-term needs like a federal agency planning process, to more formalized partnerships established between local, regional, and federal entities to undertake specific projects or activities. In the Verde River watershed, there are a number of collaborative initiatives underway that involve federal land management agencies and local partners. Two case study examples of collaborative initiatives working on issues directly connected with supporting and maintaining a healthy Verde River watershed are examined in more detail below – the Four Forest Restoration Initiative, and the Verde Front. One of the key lessons from the success of various place-based collaborative initiatives is the value of a more inclusive and open approach to involving local communities and residents in the conversation over land use, management goals, and decision making on federal public lands. This includes opening a dialouge around how public land management decisions affect the economic prosperity and quality of life of local communities. The history of the West is rife with stories of conflict between local landowners and communities and the adjacent federal public land managers. Collaboration offers a path to negotiating ideas and win-win solutions between the various interests and obligations of the parties involved, and provides a chance to move past old conflicts. This approach can be especially important in grappling with the competing interests and high tensions that are often generated in discussions over such a vital resource as water. 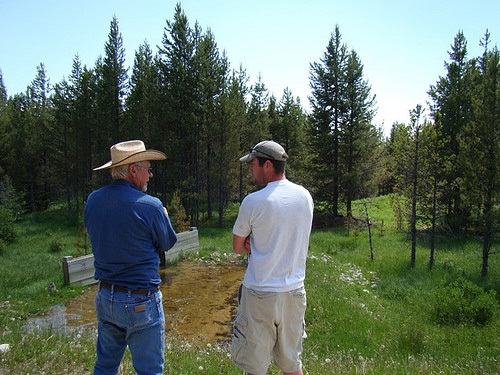 As the old saying goes, “whiskey’s for drinking, water’s for fighting over.” However, innovative approaches to resolving sticky water resource management issues have been developed through collaborative engagement of diverse stakeholders in watershed-scale discussions.